How is ConocoPhillips’ Stock Shaping Up Going Into 2019? How Sensitive Is ConocoPhillips To EBITDA Margin Changes? How Is ConocoPhillips Likely To Grow In The Next 2 Years? ConocoPhillips (NYSE: COP), is an oil energy major, that produces 1.3 Mb/d. We believe the market may be glossing over this stock, as we head further into 2019. The company has said that it plans to increase output throughout the year and we expect it to ramp up total production (MBOE) in 2019 by around 10%. This will significantly help ConocoPhillips’ revenue. Unlike its competitors, ConocoPhillips’ fortunes are far more reliant on the price of oil, as it does not have downstream operations to compensate for any down-turn in the price of oil. Since the down-turn in oil prices in 2014, ConocoPhillips’ has been able to significantly improve its operational efficiency and is now far better placed to take advantage of higher oil prices. We currently have a price estimate of $71 per share for ConocoPhillips, which is 24% higher than its market price. View our interactive dashboard – ConocoPhillips in 2019 – and modify the key drivers to visualize the impact on the company’s valuation. What has ConocoPhillips done differently to ensure that it remains profitable? ConocoPhillips has taken a series of measures to improve profitability. It has reduced cost per barrel by 10% by divesting assets where the cost per barrel were between $40-50. 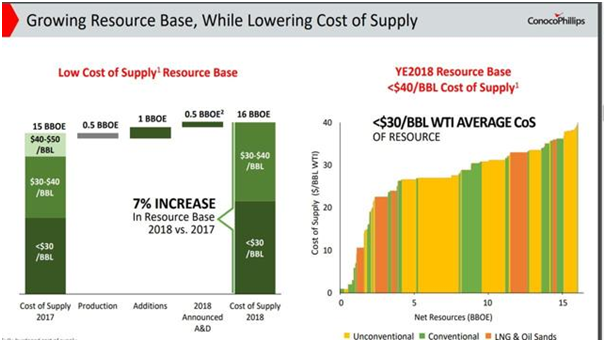 ConocoPhillips’ cost per barrel is between $30-40. This combined with an increase in oil production by 5-7% will drive both the bottom and top lines for the company in 2019. Most of the production increase is expected to come from its Bakken shale, where it will look to ramp up production by almost 18%. It should be noted that for every $1 increase in oil ConocoPhillips expects it will increase profitability by $30 million. Furthermore, the company expects to reach a position of positive free cash flow above $50 per barrel. With around 60% of its oil operations dependent on Brent, we believe there is plenty of margin of safety for the company should oil prices head downward. The coming quarters will determine how the company is faring, and should the company improve its operational performance, ConocoPhillips’ stock will see improved upside in 2019.